Scalable Predictive Dialing - Survox Inc.
Survox’s robust automated predictive dialer anticipates an interviewer becoming available and automatically calls ahead so respondents are available when the interviewer is ready to connect. The dialer manages the rate of connection attempts to ensure that an interviewer will be available when a respondent is connected. Survox’s fully integrated CATI and predictive dialing solution has all the features to deliver respondents when you need them. The Survox Dialer’s console allows you to easily monitor interviewers and connection rates all loaded studies, projects, or campaigns operational control.  The choice is yours to how you implement the Survox Dialer. On premise installation lets you manage the dial from behind your firewall. The hosted solution requires no hardware and allows for quick implementation and rapid expansion, enabling access by remote interviewers and call centers. Don’t wait any longer to reduce costs, complete quotas in less time and boost efficiency—get your quote today! We can scale beyond our peak capacity of over 500 interviewers because we are not limited by the number of interviewers required to conduct a study.